3,5 - 3.........Guys Hilo vom Norden Stamm. 1999: 88-94-87 = 269 points (11th). 1998: 90-88-95 = 273 points (6th). 1999: 96-96-14 = 206 points (29th). 1998: 90-95-96 = 281 points (9th). 1997: 90-94-96 = 280 points (1st). 1999: 70 88 95 253 points (46th). 31/08/1997: 100-94-98 = 292 points (1st). 01/09/1996: 97-76-93 = 266 points (7th). 03/09/1995: 99-95-95 = 289 points (3rd). Dago vom Schwarzen Jäger was the winner of the D.V. Meisterschaft in 1997 with 280 points and passed the ZTP with 1A rating for character and SG for conformation. His sire, Gero von der Mooreiche, was D.V. Vice-Leistungssieger in 1992 & 1996 and also passed the Körung with highest possible rating for hardness, courage and working drives. 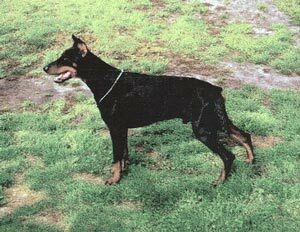 Dago's sister, Cora vom Schwarzen Jäger, was a foundation female for the vom Eschenbruch kennel in Germany. Amor: SchH 3, DV-DM participant and passed the ZTP with 1A for character and SG for conformation.